In this rural house, built in 1700, which is completely integrated in the greenery with olive and citrus trees, there are 4 apartments. The rural house is located a few hundred meters from the central square in Sorrento and near the Amalfi coast. Apartment Rosa is a well furnished apartment with air conditioning and has a beautiful garden. The mild and dry climate makes the peninsula of Sorrento an ideal destination in all seasons. It is a unique spot in the world, where you can choose between quiet and nature, culture and nightlife. The rural house can be reached on foot or by a small car via an old, sloping Roman road. For larger cars there is a secure and covered parking available 600 meters away from the house (for a fee). The center, Piazza Tasso, is about 1 km away. The house is not suitable for people who have difficulties walking because of its location. Sorrento, is one of the most well-known international tourist sights. It has a landscape unique in the world, where low and high hills, deep valleys and majestic mountains alternate; where grandiose terraces degrading towards the sea, on which have been cultivated orange and lemon trees, olive groves and vineyards . Sorrento: land of colours; Sorrento: the city of the orange and lemon groves and many other definitions for this magical land. All the definitions are true as Sorrento is indeed a very pretty little city where kindness and hospitality are a combination that is handed down from one generation to the next. Sorrento, not to be rhetorical, is indeed the land of colours: brilliant or delicate hues depending on the change of the seasons. If you just pause a moment to observe a sunset you will be amazed by the variety of colours and the beauty of the scene. Or look, preferably from the sea, towards the majestic ridge of tuff rock that changes colour at every hour of the day. The mild and dry climate for most part of the year makes Sorrento the ideal destination in every season. Today Sorrento is a modern city with may comfortable touristy facilities . In a tidy and safe atmosphere, everybody will spend his ideal holiday, having the opportunity to choose from nature and silence, health and culture, swims, thermal treatments , boat excursions, naturalistic walks, excursions and visits to museums (Mineralogy Museum, Museo Correale, Museum-workshop of wooden tarsia, Museum of Villa Fondi), to the old city centres rich in monasteries and cloisters, , and to the ancient hamlets with frescoed churches, ; but also sport and musical and cinema events of international echo, theatre performances, night clubs and bars. And it is the ideal starting point for visiting to all the tourist sights of the area (Capri, Ischia, Naples, Ercolano, Pompei, Positano, Amalfi) and for any other destination, thanks to a thick network of aerial, road, railway and maritime links. 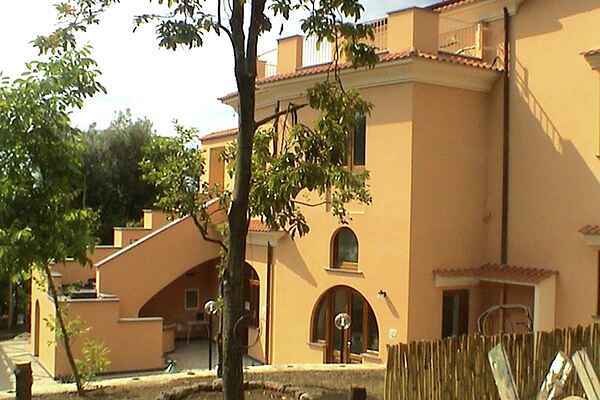 Welcome and Enjoy your Stay in one of the beautiful apartments of Casale Nunziatina !!!!! !